Have you ever gotten into your car and thought let’s go, without having the first idea of where that “go” was? Generally, when you go for a drive you have at least an idea of where you are headed. And certainly, if you’re setting out on a vacation, you have a plan. You know you want to go from Point A to Point B. Let’s say, Michigan to Maine. But how do you get there? Again, you just don’t turn on the car and say – GO. You have GPS, a ... See More map, directions of some sort. If you’re like me, you’ll want to take that further. You’ll want to know # of miles, where to stop for the night? Are there sightseeing places you should stop at along the way? How much money do you need to take for gas, food, housing, etc.? This is a plan, a strategy – something to make sure that your vacation will give you what you want. A good time. The same is true for your business. You shouldn’t just start a business and say, “Ok. I have my Facebook”, and then wait for people to come. How are they going to find you? What is it you are going to sell them? You need to put together a process. 1.What is Public Relations and how does it work? 2.Is PR more than a Press Release? 3.How long does it take to get something published through traditional mediums? Want to be featured on an upcoming podcast? Head on over to https://bit.ly/2OL7JU8. 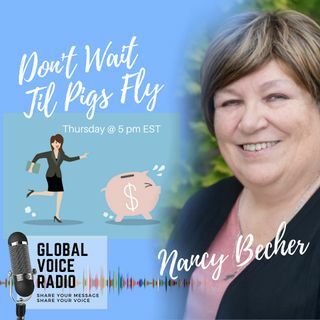 As always, you can reach me at: nancy@dontwaittilpigsfly.com; www.facebook.com/bsuflyingpigs; www.linkedin.com/in/smallbizjunkie or call me at 269-319-6041. Please comment on the podcast below with questions, thoughts, ideas for future shows, and more.